Actors Michael J. Fox, right, and Christopher Lloyd, on what predictions became reality. Toyota intends to have some fun with the 30th anniversary of Back to the Future and the launch of its latest green model. The automaker’s official on-sale date for the hydrogen-fueled Mirai is Oct. 21, 2015 -- a date made famous by Back to the Future Part II, when actor Michael J. Fox’s character Marty McFly travels 30 years into the future. To celebrate, Toyota has produced a series of videos that feature Fox and fellow actor Christopher Lloyd, who played “Doc” Emmett Brown. The first video was released Wednesday. 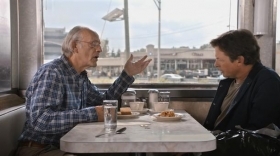 In the 43-second spot, the two actors talk about what predictions became reality at a diner. Two more videos will be released Thursday and Monday. While there are still no flying cars, nor have the Chicago Cubs won the World Series -- yet -- cars today look a lot different than the ones depicted in the movie’s 2015. The Mirai initially will be sold by just eight Toyota dealerships in California and has a starting price of $58,325, before incentives, including shipping. Toyota has said the sedan has a range of 312 miles. The company also hinted the video to be released Thursday might include a Tacoma re-creation of McFly’s Toyota pickup from the movie series.